My answers to frequently asked questions plus, back from the Mezozoic, the story of this website and ye olde blog, Madam Mayo. A helpful orientation and checklist by Laura Pepper Wu. Found via my amiga the novelist Leslie Pietzryk's excellent Work-in-Progress blog. P.S. What Wu says about Mail Chimp is spot on. Reflections on the whys and wherefores plus five lessons learned in March 2017. Cogitations of 2016. Pugs appear. My talk for the panel on writers blogs at AWP Seattle 2014. A handout from my workshop for the May 2008 Maryland Writers Association Conference. Madam Mayo's "Gone to the Litblogs": an archive of posts on lit-blogging; includes many helpful links. by C.M. Mayo. Originally published on the Writer's Center's blog, First Person Plural, May 5, 2010. I deactivated my Facebook account in August of 2015 and have been feeling massively relieved and more productive ever since. And no, I have not noticed any decline in blog traffic or book sales. By C.M. Mayo Originally published in Literal: Latin American Voices / Voces Latinoamericanas #17 The social network. 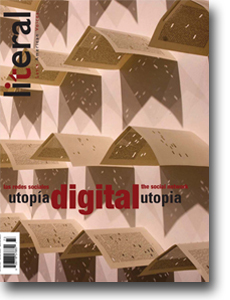 Digital utopia / Las redes sociales. Utopía digital. Summer 2009. Based on award-winning writer and avid podcaster C.M. 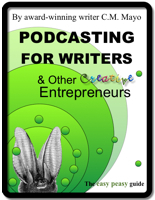 Mayo's one day workshop at the Writer's Center, this ebook provides an introduction and overview of podcasting for writers, from basic concepts to nuts-and-bolts tips. In 10 "easy peasy" steps (along with some "fancy schmancy" alternatives for those so inclined). Mayo shows you how to generate and publish your unique podcast  and yes, get it onto iTunes. Ye olde blog post from 2011. Still taking my own advice. I welcome you to sign up for my newsletter here.